Lilianne Milgrom’s new works combine the classic European tradition of skilled figurine work with a contemporary sensibility. 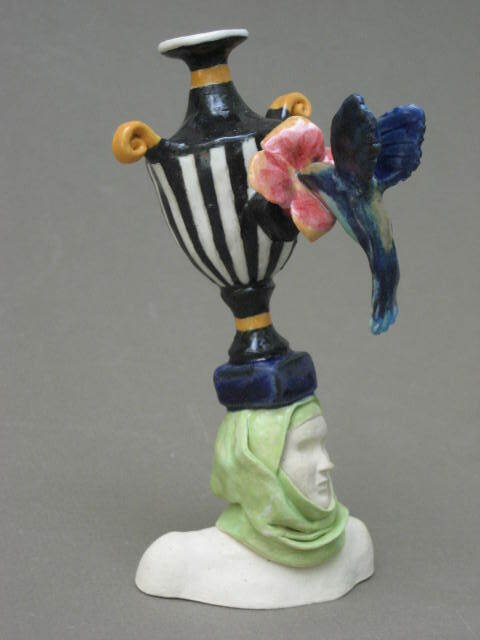 The series of ceramic creations, each balanced upon a woman’s head, could be described as sculptural collages. The burdens, joys and dreams which women carry inside their heads are released in a delightful and thought-provoking way. Despite their miniature scale, the pieces pack an outsize punch. My six-week stay in Paris was extremely productive. I was involved in a very interesting and rewarding project on the theme of female sexuality. I was very fortunate to have two articles about my work published in Bonjour Paris. Art writer and historian Bill Robinson-Parks writes about the exhibition in glowing terms and puts Milgrom’s works in a historical context. “Milgrom on Morandi” an exhibit of ceramics and paintings by Lilianne Milgrom inspired by 20th-century Italian still-life artist Georgio Morandi will open Friday with a reception from 6 to 8p.m. at Cross MacKenzie Gallery and continue through Sept. 11. Milgrom created ceramic versions of the bottles, vases and boxes in Morandi’s paintings. She then arranged her creatins in Morandi-like compositions of her own design, which she then rendered as still-life paintings. Check out curator, critic and artist F. Lennox Campello’s recommendation (June 15 entry) for Milgrom’s Cross MacKenzie exhibition opening June 19, 2009. The definition of just what constitutes a family and the family experience is constantly evolving. Ranging from notions of simple genetics to those of greater inclusion, the description and complexity of the family unit remains a fascinating aspect of the human experience that clearly invites exploration and reflection. A number of artists reflect happy family lives, celebrating the comforts of happy occasions with emotionally convincing personal narratives. The porcelain piece actually is a book sculpture that was used in a video project by Lilianne Milgrom of Fairfax, Va., titled “Living Without Them.” The video, which plays on a small monitor next to the book, is about the intentional destruction of books and the resultant impact on culture and civilization. 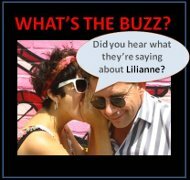 Lilianne Milgrom is interviewed on ‘It’s a Woman’s World’ about her background, creative resume and current work. Curator, critic and artist, F. Lennox Campello, viewed Milgrom’s Living Without Them exhibition and had some very powerful words to say about the work. Milgrom lived in the paradoxical world of the Middle East, where bombings, bombs and their after effects were daily common life. And her psyche and her artistic persona were forever shaped by terrorism and a world where murderers are often heroes to some and demons to others. Chairs have always held a fascination for me – from their functionality, beauty and intrinsic human qualities. Throughout the ages, the “seat” has symbolically represented power and social standing. Today, the chair is no less a symbol of undeniable power, if somewhat more subtly disguised. In this video work, I am exploring the chair as metaphor, taking as my launching point the universally recognized children’s game of musical chairs. View a comprehensive pan of the multi-media installation Living Without Them at the American University Museum in May 2008. Descriptive insights by curator Roxana Martin and Professor Saul Sosnowski.